About 20 city, local and state officials were present to announce transportation developments at Philadelphia City Hall in planning for the large amount of visitors expected in Philadelphia come September. 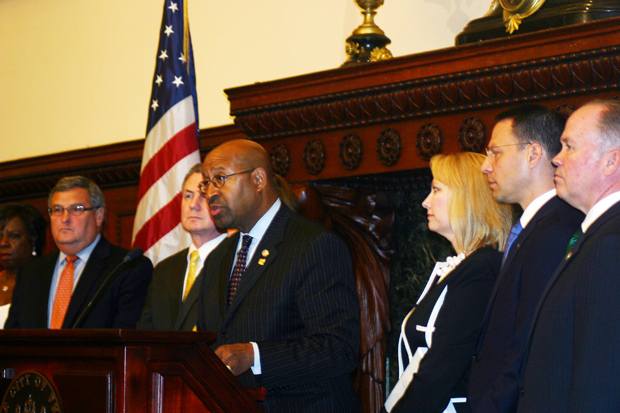 Representatives from SEPTA, Amtrak and the Philadelphia International Airport, as well as Mayor Michael Nutter and Donna Farrell, executive director of the World Meeting of Families, spoke of plans for moving up to 2 million people in and around Philadelphia for the visit of Pope Francis, Sept. 26-27. The World Meeting of Families, which expects to draw some 15,000 people from 150 countries, will precede the papal visit, taking place Sept. 22-25. Nutter urged visitors and residents of the region to plan their transportation needs accordingly during that time to accommodate the expected crowds. 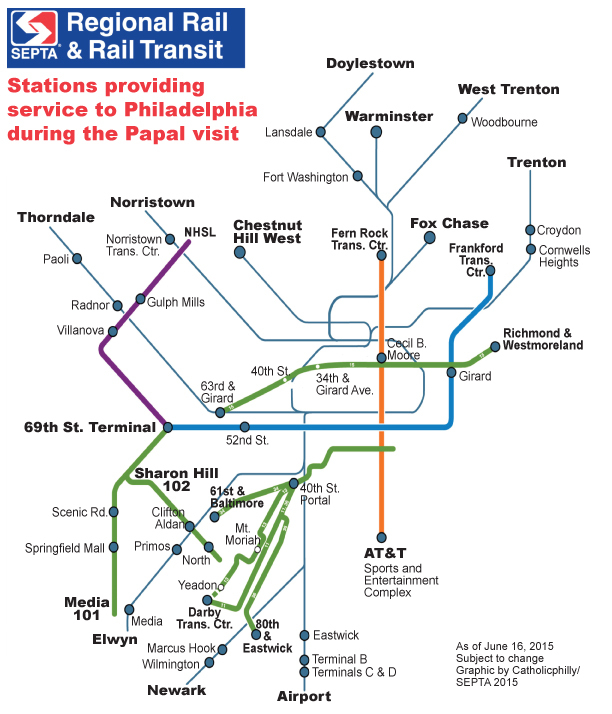 Though details were sketchy, SEPTA General Manager Joseph Casey described the regional transit agency’s plans for traveling to, from and within Philadelphia easier during the time of the pope’s visit. Transportation during the World Meeting of Families itself will adhere to normal SEPTA transportation schedules. The weekend of the papal visit, however, will pose a “significant challenge,” Casey said, in which regional railways, subways and trolley schedules will be modified. SEPTA is “putting together a high-speed system” so that the expected 650,000 to 700,000 SEPTA riders for that weekend will be accommodated, more than double the typical weekend volume of 300,000 riders. A tentative express train schedule is set to be released later this summer. But Casey did describe how during the papal visit, SEPTA’s Regional Rail lines will run as express trains on all 11 lines with only one or two stops per line, a total of 18 stations. System-wide, only 31 of 282 stations for trains, subways, trolleys and buses will be utilized. Riders will need to travel to the outlying stations and board a train that will go directly to center city Philadelphia. After passengers disembark the train, it will return on that line without intermediate station stops to the outlying stations to receive more passengers through each day of the visit. SEPTA also intends to add trains to its system to maximize ridership during that weekend. The Market-Frankford Line, Broad Street Line, trolleys and buses in the system will run on modified schedules. A full service plan for the World Meeting of Families is expected to be announced in mid-July. Additionally, Regional Rail riders will need to purchase $10 daily passes in advance for Saturday and Sunday, Sept. 26 and 27, beginning July 15. They may not be purchased at stations prior to boarding a train on the day of the event, and only a total of 150,000 passes will be sold for each day. Monthly TrailPasses for regional rail lines would not be honored during that weekend, though monthly passes for buses, trolleys and subways would not require an additional pass. Passengers commuting to World Meeting of Families events may purchase a $10 three-day pass for all SEPTA subway trains, buses and trolleys. SEPTA officials are set to expand 26 city and eight suburban bus routes to meet the weekend’s needs, though these routes have not yet been identified. Officials are also looking into expanding service on bus routes to the airport, though no plans have been finalized. Officials still have not worked out issues including possible increased parking availability at train stations or shuttle services to and from station lots. Commuters from the suburbs into the city will likely only be minimally affected during the weekdays, Casey said. Regional rail parking lots will continue to be free that weekend, but maximum capacity is expected. SEPTA reminds riders not to expect to easily find a parking spot at a regional rail station. Details on how to move people out of the city following the papal Mass are still in development, although long lines are expected at SEPTA’s three center city stations – 30th Street, Suburban Station and Jefferson Station. Even a determination as to which of the stations will be utilized has not been made because the U.S. Secret Service has yet to finalize those security measures. Casey advised all residents and visitors planning to attend the papal visit to begin planning alternative arrangements now, such as being dropped off at a regional rail station instead of driving and seeking one of a limited number of parking spaces. Attendees were especially advised not to use their cars to go into the city, but to rely on public transportation. Even after arriving in Philadelphia via SEPTA for events, Farrell advised that visitors “be prepared to walk a few miles or more,” during that weekend due to the high volume of people who will be in Philadelphia to see Pope Francis. As an example, Farrell said visitors walked about three miles to events in Milan, Italy, site of the last World Meeting of Families in 2012. She also announced two new World Meeting of Families’ public service campaigns intended to aid in transportation: “Know Before You Go,” for Philadelphia visitors, and “Papal Visit Playbook,” for residents. Each provides detailed maps, updates and directions so that people can move about as smoothly and efficiently as possible. Residents and visitors can register to receive a guide online at worldmeeting2015.org; the information will be released to the public later in the summer. Amtrak and the Philadelphia International Airport are also preparing to bring extra visitors to the city. Amtrak official Rina Cutler said seats usually unreserved on the popular Northeast corridor and Keystone lines will require reservations for the weekend of the papal visit. Cutler said extra cars and trains may be added, and she urged riders to book tickets as early in advance as possible. The airport, however, anticipates less fluctuation in schedule due to the defined nature of air travel. Nutter said that because there are seven or eight international airports from New York to Washington, D.C., air travel to the World Meeting of Families may not pose as significant a problem as public transportation or train usage. What is most important for visitors to remember, he said, is the need for flexibility and to plan as much in advance as possible.